I support breastfeeding and co-sleeping when that is what works for the family; occasionally a nursing relationship becomes complex in the toddler and preschool years if the whole relationship becomes about nursing: The nursling wants to nurse every time s/he sees the mother, insists on it, throws a fit if s/he cannot nurse then and there, etc. I have helped families dealing with such a situation, so I’m offering a little bit of insight here. Although it is not exclusively the purview of milk remedies, older children who still are wanting to nurse frequently often benefit from a milk remedy. [I learned this from Lou Klein.] Milk remedies are made from the milks of animals–lioness, mare, dolphin, for instance. The pregnancy that carried a child who benefits from Lac Maternum often seemed idyllic to the mother. She will describe the pregnancy as being so amazing, that she spent a lot of time meditating, walking, etc. This part gets a little “out there,” so beware: Apparently, the issue, then, for the child is that the space is so open that s/he doesn’t come fully into his or her body and cannot individuate or needs the comfort of that attachment to the mother to comprehend connection to the physical world. One boy I helped, G, was a year old when his parents asked for my help. He woke frequently at night to nurse, couldn’t nap outside her arms, and wanted to nurse every time he was reunited with her–even if she’d simply left the room for just minutes. She was exhausted, as you can imagine [she had two older children too!]. I inquired about the pregnancy and, sure enough, she described the amazing pregnancy she’d had–meditating, etc. I suggested Lac Maternum 30c. G did incredibly well on the 30c … for 24 hours: He woke only twice at night, napped by himself, was much more contented. Since it lasted him only 24 hours, I suggested Lac Maternum 206c next. Yes, you read that correctly–206c. There was no 200c, only 206c. G’s response was magical–much greater contentment, easier time with visitors, blossoming relationship with his mother that was not confined to nursing, asking to sleep in his crib, and eventually sleeping through the night. His parents reported that G was much happier and that G’s progress opened up possibilities for their family and a lovely new family dynamic, not to mention better sleep for his mom! G took doses as needed from then on, approximately monthly for several more months, and of course with each dose, the difficulties dissipated more while the joys increased exponentially. Such a blessing! In another case, a girl, D, was on the cusp of her 4th birthday. D wanted to limit her nursing according to her mother’s wishes, but she just wanted to nurse soooo badly! If she couldn’t nurse, she’d ask to just hold her mother’s breasts. Her mother worked outside of the home, and immediately upon returning home was greeted with an eager nursling. D’s younger brother nursed even less than she did! What struck me about D was that she did not have favorite anythings–except nursing. No favorite color, game, etc. And her mother had enjoyed long meditative walks, frequent meditation, etc. during pregnancy. D took Lac Maternum 206c, after which she blossomed with a brightened confidence that showed itself in independence [playing on the backyard swing by herself, for instance], had a better appetite, and became less and less interested in nursing. D’s mother left on the longest business trip of the D’s life [one week, overseas] just one week after D started the remedy. This did affect D’s swift progress, but I’m glad she had the benefit of the remedy when she was going through the difficulty. And, on her fourth birthday, D officially and happily weaned and never looked back. Our family has used homeopathy for over 10 years, the majority of it being pretty basic: Arnica for trauma & bruises, Calendula for stings & scratches. After reconnecting with Pamela a few years ago, and finding out she studied homeopathy, she has become our go-to person for various ailments. Awhile back, I asked Pamela for help with weaning L. Pamela noted that young L reminded her of a cat, with a Cheshire cat grin. [As confirmation, kittens were L’s favorite animal, too.] And Pamela and I discussed how difficult L can be, beyond the typical “terrible two” behaviors. It was obvious she has a strong personality but our whole family had been negatively affected by L’s intense outbursts and unreasonable demands. Pamela felt that I should try Lac Felinum (Cat’s Milk) as a remedy for L. We tried it and it worked! After a dose, L was much more reasonable and cooperative, and not prone to terrible outbursts. More recently, Pamela provided valuable assistance with my husband’s minor surgery. She gave him a special surgery remedy and recommended dosages before and after his surgery. Of course the hospital provided vicodin for pain, but with Pamela’s special surgery remedy (and continual contact) he was able to heal and recover without taking any of the pain medications. She checked in with us all weekend to see how he was feeling and made changes to dosages as needed. We feel very fortunate to have had Pamela’s homeopathic assistance over the years. In our efforts to bring full and complete healing to our daughter, we are working with Cynthia Slon, an amazing telepathic intermediary. She is helping us apply unconditional love to further our daughter’s healing. As part of that work, Cynthia told us that Spirit recommended that we watch an interview with Anita Moorjani, who had a near-death experience while in a coma. While Ms. Moorjani was outside her body, she experienced unconditional love and understood that the reason for her physical pain and disease was that she had lived a life of fear. Although she enjoyed being free of pain and discomfort in the other dimension, she also came to understand that if she returned to her body embracing the unconditional love that she’d felt on the other side, she would be fully healed very quickly. As you might imagine, she did choose life, and she did heal completely and quickly, and now she shares her message of unconditional love with the world. I had been noodling on why homeopathy helped my daughter so much more than the many other modalities we’ve tried, and I had decided that even though she typically receives her doses as seldom as once a month, the vibration of the remedy stays with her and she can continuously access it. Unconditional love is the highest, most expansive vibration capable of creating matter. I had to write it on my hand so that I could read and re-read it to absorb it! When Creation offers itself to a homeopathic remedy, perhaps it offers that vibration to be used as a means of unlocking unconditional love, of letting it flow so that it can create, bridge, restore, heal. That’s such a beautiful thought, I feel like I need to include a break here to absorb it and let you do the same! Then I tried re-routing the line of thinking … What is unconditional love? God is unconditional love. It is the Source of Creation. And the Source is energy, which underlies all matter. So if unconditional love is this pure energy, perhaps that is what gets distilled into homeopathic remedies. And that brings me back to Cynthia’s statement: Unconditional love is the highest, most expansive vibration capable of creating matter. Like Maya Angelou, so touched by knowing that God loves her, I am overcome with gratitude that Creation would give to us so generously, so that we might heal. Imagine the generosity, the Grace. Amazingly, the very afternoon that I began thinking about this, I received what I took as confirmation. I really enjoy Oprah and her Super Soul Sunday show. She recently interviewed India Arie, an interview which I thoroughly enjoyed. I don’t even remember why, exactly, but I felt connected to Ms. Arie, like we had a lot in common and could sit and chat for hours … even though she’s a musician and I’m a homeopath! Perhaps the way she feels about her music is how I feel about homeopathy … butI digress. No wonder homeopathy is so powerful–homeopaths [generally] meet a person where they are, without judgment. This is a place of unconditional love. Then the remedy is given, embodying and delivering unconditional love for the unburdening of the receiving person, animal, or plant. That is one beautiful process, and I am honored to be a part of it. But my thought process on this is still going … so I’d be glad to hear your thoughts on the matter too! Make it easy, faster, better with my Surgery Support package. CLICK HERE. If you are looking for my National Center for Homeopathy webinar on recovery from surgery, it is available for viewing on YouTube. Webinar attendees also requested access to the slides for reference: Surgery Webinar Slides. Sometimes we use homeopathy simply to support healing during allopathic treatment. Surgery is one such time. When you’ve decided to undergo surgery, homeopathy can speed healing or the surgical site while controlling pain. To me, that’s a win-win. You can order the Helios surgery combo here; in the Order section, just request the Surgery combo in 200c & 30c, 4g, granules. Then use it as described below. – Any or all of the following remedies that are pertinent to your surgery in both 200c and 30c: Arnica [bleeding, swelling], Bellis Perennis [deep tissue injury], Calendula [fight infection], Hypericum [nerve repair], Staphysagria [incisions]. If your surgery also involves ligaments or tendons, you might add Rhus Tox and Ruta to your mix. If it is for dental surgery, I’d suggest you include Arnica, Calendula, Hypericum, and Ruta. For joint surgery, I’d suggest you include Arnica, Calendula, Hypericum, Staphysagria, Rhus Tox, and Ruta. If the surgery involves broken bones, you could add Symphytum 6c, 12c, or 30c to each of the bottles described next. 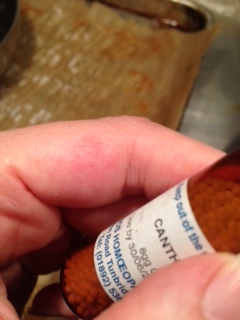 ~ Put 5-10 pellets each of all of the 200c potencies in one bottle together, then fill the bottle with distilled water. When the pellets have dissolved fully, shake the bottle just enough to mix. Label it “Surgery 200c” or something similar. You will use this in the first 2 days of recovery. One dropper, one teaspoon, or one sip/gulp is one dose of remedy. 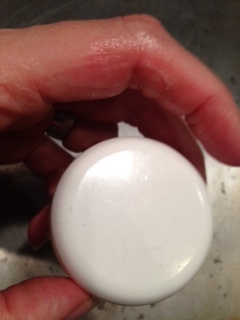 ~ Put 10 pellets each of all of the 30c potencies in one bottle together, then fill the bottle with distilled water. When the pellets have dissolved fully, shake the bottle just enough to mix. Label it “Surgery 30c” or similar. You will use this after the first 2 days of recovery, when you are no longer using the 200c. One dropper, one teaspoon, or one sip/gulp is one dose of remedy. Before Surgery: Take one dose of Arnica 200c to limit bleeding during surgery. Immediately after Surgery: Take one dose of the Surgery 200c. Recovery from Surgery, First 2 Days: Initially, you will have painkillers and anesthesia in your body from the surgery, making it harder to use your discomfort as a guide. So, about 2 hours after surgery, take another dose of Surgery 200c. From then on, you likely will be able to use your pain as a guide. Typically, in the first 24 hours after surgery, people need 2-5 doses of Surgery 200c. You should need less in the second 24 hours than you did in the first 24 hours. One reason I like to recommend using the pop-up spout water bottle for the remedy is that it is easy to use at night, and it is important to stay on top of your dosing at night too. Take it when you need it, but if you need it more than every 2 hours, use the allopathic pain medication given to you by your physician. Recovery from Surgery, Third Day onward: You should switch to the Surgery 30c on the 3rd day of your recovery, taking it as needed. Again, you may start with 2-5 doses in the first day, every 2 hours at the most. Stay on top of it at night, and taper as needed. Within a few days, you should no longer need the Surgery remedy combo. One “problem” with supporting recovery from surgery homeopathically is that healing is faster and better than expected. You’re probably wondering why that is a problem! It can be an issue when a person [or animal] is supposed to restrict movement for a certain amount of time based on conventional ideas about how long healing takes. In other words, a two-week movement restriction that is imposed based on expectation of conventional recovery might be too long for someone [or a pet] that is being supported homeopathically. This is why I suggest that you ask your doctor [or vet] about any restrictions on movement: Instead of sticking to a time-frame, ask what signs would indicate adequate healing that would make movement permissible. Or, if they need to see the surgery patient, schedule your appointment a little sooner than they normally would. So, if they normally would see the patient for a follow-up after two weeks to verify adequate healing and thus permit movement, schedule for a week or 10 days instead. …Pamela provided valuable assistance with my husband’s minor surgery. She gave him a special surgery remedy and recommended dosages before and after his surgery. Of course the hospital provided vicodin for pain, but with Pamela’s special surgery remedy (and continual contact) he was able to heal and recover without taking any of the pain medications. She checked in with us all weekend to see how he was feeling and made changes to dosages as needed. Really good constitutional homeopathy can be incredibly helpful with preventing illness and making the illnesses we do get very mild. Of course, if we can’t beat it easily, we also have treated acute illnesses [e.g., flu] with homeopathy, which lowers the duration and the intensity. Clear the air and bedding in the room daily. Most people make their beds as soon as they awaken. The risk is that you’re just closing up a warm, often damp environment which is a perfect breeding ground for germs. So open up your sheets then open the window. If you can open your windows wide for an hour to air-out the rooms, great. Otherwise, just open them a tiny crack and leave them like that all day. Next to constitutional homeopathic work, this is probably what made the single biggest difference in how often we got sick. Salt lamps also help to clear the air, but they can only clear the air around them in a sort of dome, so the bigger the lamp, the farther it can reach, or you’d need multiple lamps. I also have found they are most effective when left on 24 hours daily. They are a subtle glow, so they work like a nightlight for kids; adults tend to have a harder time with them. If you live by the salt air, that makes a huge difference, too. You’d be surprised what the body begins excreting once it’s gotten some salt air. For the kids, I put Wild Harvest Orange Flavor Echinacea + Goldenseal [half-dropper for my 3 y.o., full dropper for my older kids] into a glass then fix Emergen-C in there for them. For the little ones, I typically split a regular Emergen-c packet between two glasses or use Emergen-c Kids; for my older son, I use a full packet of Emergen-C. My kids like Pink Lemonade and sometimes Tropical flavors of Emergen-C. The Wild Harvest elixir is the only one I have found that has a mild enough taste for my kids. Emergen-C is made with the kind of vitamin C that is not bad for your teeth or hard on your stomach, from what I understand, and our experience is that if we drink too much of it, the worst that happens is we get neon pee. Of course, the kids think that is fantastic! My husband and I fix a glass of Emergen-C and take 2 VitaBiotic with the Emergen-C. If it doesn’t work on that first dose, chances are we are getting sick and we just let that happen. There are occasions, though, when it will be effective for several hours then symptoms will reappear. If that happens, we repeat the Emergen-C + VitaBiotic. We also do this preventively when we get the feeling that we are susceptible. I don’t take it a whole lot, though, overall, because I’m a less-is-more kinda gal. We do use Vitamin D3 in the Winter, also, since we live someplace with minimal sunshine for many months. The most tasteless we’ve found is DDrops by Carlson. They make various IU levels–50IU for babies, 1000IU for kids, 2000IU, and 4000IU. It hides extremely easily in drinks, though most of the family is not bothered by the taste. The kids generally like taking it, waiting for the drop to fall on their tongue seems to be funny! There are some people who say you should only take supplements in their most natural state, because that makes the vitamins most bioavailable … and for Vitamin D, they say it should be in Cod Liver Oil that is processed at low temperatures etc. A lot of people espouse the use of Butter Oil with the CLO. You can check out Green Pastures for more information on their product, which is what I use in capsule form. If you have taste-tolerant children, and I don’t but was able to do this successfully anyway for a time, you can put the CLO/BO in the fridge and then roll it into a ball with a tiny spoon and give it to them like a pill [I used a smidge of Mexican Coke to help them wash it down!]. We generally follow a whole foods diet, and we try to stay low on sugar–sugar is an immune buster for sure. Here’s a resource http://www.nourishingourchildren.org/Alarm.html. Adequate water helps rid the body of toxins too! Take a probiotic [the best I have found here come from my Naturopath so I cannot recommend one OTC though a lot of people take those just fine]. I read that fermented vegetables have way more probiotic goodies in them than the pills you take. Beet Kvass is a good immune booster and a natural probiotic. One year when we took that regularly, it made a huge difference in our immune health. It’s easy to make. You can google a recipe, but the basic is that you peel and chop chunks of beets into a half-gallon jar. Add 1/4c [?] of whey from yogurt, salt, and water. Let it ferment for 2 days. My husband and I drank a glass a day. http://thenourishingcook.com/how-to-make-fermented-beet-kvass/ for a recipe. And for homeopathic self-care for acute ailments, the Helios homeopathic kits are very handy–they contain the remedies and reference material all in the case. With Helios remedies, one pillule=one dose, so those little vials go a long way. No attorney-client relationship or doctor-patient relationship is intended, implied or created by the posting or viewing of information on this site; nor is a doctor-patient created by the submission or exchange of questions or information via email or otherwise with Pamela Lialias. My son stepped on a firecracker that was extinguished but it turned out that it was still hot. I gave Cantharis 30c and had him put it on a bowl filled with ice. It felt better for an hour then the pain came back and 3 blisters were forming. Since it was bedtime, I gave a 200c with the hopes that it would last him through the night. 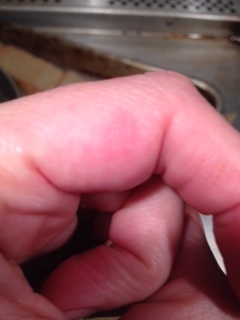 The pain did subside, and when we awoke in the morning, there were 3 little white dots surrounded by a slightly pink area. It never hurt again and cured completely on its own with no further intervention. Here’s what you can learn from our experience … the nuance of selecting a potency. In general, remedies in the “c” potencies are those first considered for physical ailments. The lower the potency, the faster its action. Sometimes, though, the remedy is effective but doesn’t seem to have staying power in a lower potency. You have two choices at that point: repeat the remedy at that potency, or go up in potency. In this case, because my son was in good health overall, the Cantharis 30c was effective but lasted only an hour, and we were headed to bed which made hourly re-dosing unlikely, I gave the 200c next. I once read an article about someone who kept bees. Recently interested in homeopathy, he had a kit of remedies in the 6x potency [“x” potencies are even lower than “c” potencies]. Having been stung by a swarm of bees and realizing he was having a systemic reaction, he grabbed his kit for the long drive to the hospital. He had to take a dose of the remedy every 5 minutes while en route to the hospital, but by the time he arrived 20 minutes later, he was quite fine! Here is another example: When my daughter was little, I fell down the stairs while carrying her. We were being treated by different homeopaths at the time. I took Arnica 200c [for bruises, trauma, and ailments from falls] and Aconite 200c [for shock and fright]. My daughter’s homeopath insisted that I treat her with 30c only. I was fine the next day. My daughter was fine, eventually, but it took a week. That does not mean that a higher potency is always better! If you give too high of a potency, even with the right remedy, you can cause an aggravation–a worsening of symptoms. So you have to get a feel, through experience, of what level of injury responds to 6c, 30c, or 200c for you. 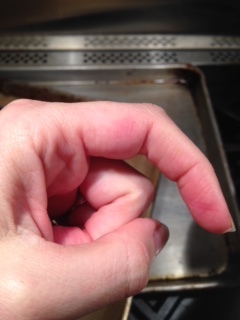 In general, in our family, I evaluate it like this for acute [temporary] issues: hmmm=6c, ow=30c, wah=200c. 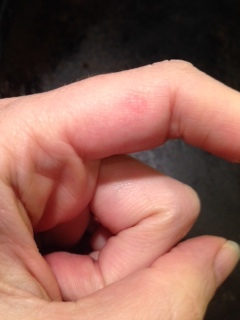 When I’m using a 200c, I’m wondering if it’s bad enough that it requires immediate medical attention. If I’m thinking about a 1M, I definitely am also thinking about a trip to the E/R. There are several remedies for burns. 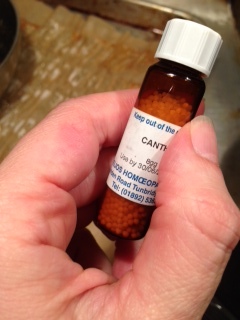 I went with Cantharis, which is what is in our homeopathy kit from Helios. 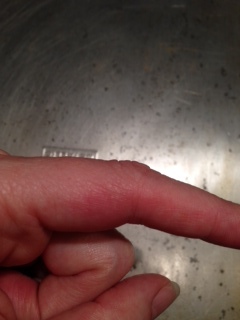 It is beneficial for burns that are better from cold applications and have a raw, burning feeling. 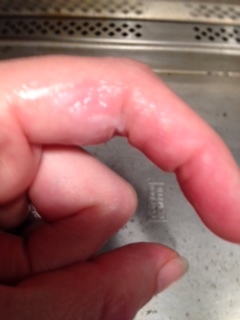 Here’s a little article to help you choose a remedy for burns if ever you should need one. An update from one year later! “As Needed”: What does that mean? In general, the dosing concept followed in homeopathy is the “minimum dose.” That means we give the lowest potency at the least frequency required to effectively treat the issue at hand. True to its individualistic approach, even the dosing will be different for different people and different situations. So you’re tracking your progress. You notice that after you take the remedy, your symptoms improve. Jot down what gets better [e.g., sleep is more restful, pain reduced 80%, didn’t get sick when the rest of the house did, was able to do schoolwork that previously seemed impossible]. Enjoy that improvement! If you notice a sag in your progress [e.g., sleep not quite as restful, a little more pain, trouble with schoolwork], jot that down too. There is an ebb and flow to healing, so sometimes we experience a dip and then progress again. Sometimes, the dip remains a dip, even after a few days. At that time, it typically is time to re-dose. Typically, we develop a pattern with a remedy and potency — one person might need to re-dose every 12 days while another person tends to need another dose every 21 days. If you feel you need to re-dose sooner than I advised you, contact me before re-dosing because we might need to adjust the potency.